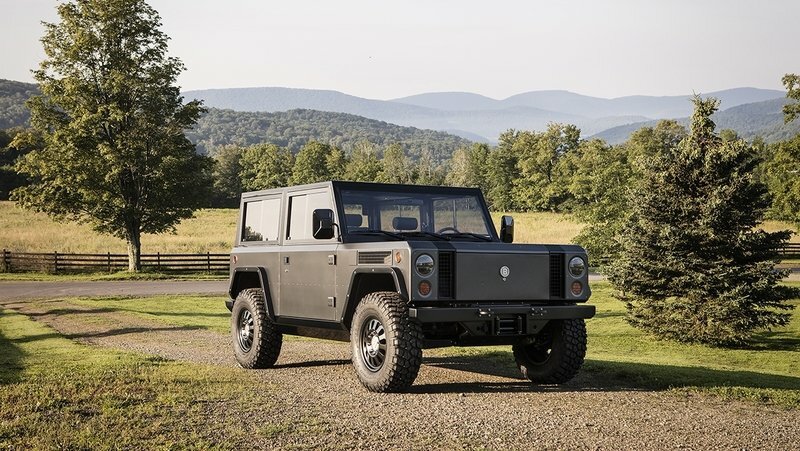 Bollinger Motors sent shockwaves through the auto industry in July when it debuted its prototype all-electric utility vehicle, the B1. That two-door version boasted a promising range of 200 miles, a towing capacity of 6,100 pounds, and a 0-to-60 mph time of only 4.5 seconds – all wrapped in an aluminum body and riding on a four-wheel independent suspension system with 4WD. Well, now Bollinger has announced it will also make a four-door version of the B1. Robert Bollinger, the CEO of the start-up automaker and designer of the B1, says the four-door version will be nine inches longer than the two-door B1, yet will otherwise offer the same range, weight capacities, and off-road capabilities. What changes is the ease of getting into the rear bucket seats and the additional six cubic feet of cargo volume, pushing its overall cargo volume to 101 cubic feet. Of course, the four-door B1’s breakover angle will be less, but only drops to 33 to 31 degrees. The 56-degree approach and 53-degree departure angles will remain the same. Two electric motor choices are available: a 60 kWh and a 100 kWh option. As expected, the impressive range and 0-to-60 mph specs are set with the 100 kWh motor option. Official pricing hasn’t been announced, but Bollinger is shooting for an MSRP of $60,000 for the two-door, 60 kWh B1. Opting for the 100 kWh version is said to be another $8,000. Expect pricing to be slightly more expensive for the four-door variant, perhaps starting around $70,000 for the 60 kWh model. As for availability, Bollinger is still solidifying a production deal with a third party (rumored to be AM General). Should that work out, the B1 could begin selling in early 2019. Read more on the 2019 Bollinger B1. Today, Bollinger Motors revealed the first image of the 4-door version of its B1 all-electric sport utility truck. The sketch also shows off a new orange exterior color which will also be available at launch. Adding the 2 doors creates a new overall vehicle length of 159 inches and new wheelbase of 114 inches. While the truck will have the same class-leading ground clearance (15.5 in), adjustable wheel travel (+5/-5 in), approach (56) and departure angles (53) it will have a new breakover angle of 31 degrees. The lengthier vehicle now provides an additional 6 cu. ft. of cargo volume for a total of 101 cu. ft. Both the 2- and 4-door variants will have the same battery options available of either 60 kWh or 100 kWh. Engineering the B1 to production is underway and additional specifications and information will be made available in future announcements.